‘Twas the day before Dinner for Pretty Special Guests. You know, one of those meals for which you concoct dozens of potential menus in your mind before finally, nervewrackingly, committing to just one. But rather than hurrying through page proofs, e-mails, and voice messages so I could head home to tend to cleaning and chopping and pacing and Champagne chilling, I was sitting in my office staring at the lumpy sack of strange-looking tubers known as sunchokes plunked, quite unceremoniously, beneath my desk. I’d swung by the greenmarket on my way to work that morning with the homely looking Helianthus tuberosus on my mind. I’d been flirting with these curious tubers since they’d shown up at the market several weeks prior, but they hadn’t exactly exuded much charm, not with their oddly knobby, dirty appearance that suggests a madcap cross-pollination science project—part potato, part ginger—gone terribly wrong. 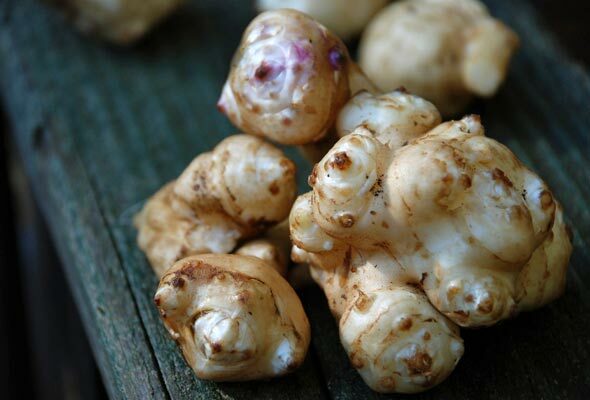 And not with their confusing alias, the Jerusalem artichoke, which has clung to the ‘chokes for decades despite the fact that they bear neither a relation to Jerusalem nor a resemblance to an artichoke. I’d been seeking the perfect excuse to play with them, but not really knowing what to make of them—or with them, for that matter—I hadn’t summoned enough gumption to try them. Until now. I’d been thinking that a dinner party for folks with rather traditional predilections wouldn’t be satisfying without something at least a little potato-y. Piled up next to crates of russets and fingerlings, these tuberous things looked like potatoes. And the little handwritten sign at the market assured me that they behaved like potatoes. So I’d lingered a little that morning, sidling up to the chefs in their whites who were buying them by the bushel and soliciting their take on them. Then I crammed sunchoke after misshapen sunchoke into a bag before I could back out. Turns out he’d already colored outside those exact same lines this past Thanksgiving. We bantered about the relative merits of slicing the knobby things or leaving them whole, tossing them with nothing more than olive oil or indulging them in a bath of duck fat, subjecting them to the blast of a hot oven or a more temperate romp on the stovetop. Then he offered perhaps the most critical part of sunchoke cookery: not to even bother peeling the knobby little suckers (and half of your knuckles along with them). Just wait, he said. The skins turn thin and crisp, crunchy even, after cooking, such that you can slip them right off. (You can, he continued, also peel them using the old truc for ginger, scraping the skin off with the tip of a spoon.) Decision made, I thanked my him profusely, then plodded through my page proofs, grabbed my potato-wannabes, and practically pranced home. They were lovely, that initial batch. The skins had turned to parchment while the interior had puffed like little pommes duchesse. The heat rendered them crisp outside, tender within, and intriguingly sweet throughout, just as I’d been assured. That was three years ago, yet I still remember that side dish like it was last night’s supper. Since then, I’ve come to have quite an intimate relationship with sunchokes, deviating somewhat from that initial foolproof technique and succumbing to all manner of my original temptations. Steamed. Sautéed. Souped. Crisped in thick chunks in oil. Even shaved raw atop salads, crisp as a water chestnut. They’re so darn similar to potatoes, yet something in the innate tuberosity of sunchokes makes them moister, sweeter, better able to inflate like jumbo marshmallows over a campfire. But let’s be clear about one thing. It’s roasting that’s my preferred approach, the one I keep coming back to. It’s worth noting, I’ve never once bothered to remove their skins before cooking. Heck, if they’re papery thin, they can even be ignored. As with most greenmarket finds, sunchokes have a season. They’re amply available during cooler months, and rather maddeningly elusive to find at all other times. (I know what you’re thinking. But you can forget about stockpiling them. They don’t keep particularly well, and definitely not as swell as potatoes. For some of us, the absence makes us a little sad when spring eventually comes around. Sunchokes tend to have that kind of effect on people. 2. Scrub the sunchokes well under cool running water with a brush or a cloth. Scrub them really, really, really well. Pat each sunchoke dry and slice it in half lengthwise. Place them in a metal roasting pan (not nonstick) that’s large enough to accommodate the sunchokes in a single layer. Toss with the olive oil and spread in a single layer, cut side down. 3. Roast the sunchokes until the cut sides are golden and crisp, the skins are slightly puffed, and the insides are tender throughout, 25 to 40 minutes, depending on the size. 4. Let the sunchokes cool on the pan slightly, then use a metal spatula to swoop them off the pan. (Sunchokes tend to caramelize quite easily, making the cut sides rather tricky to pry from the pan but oh so lovely to eat. Letting the sunchokes rest a few moments before using a swift motion to release them tends to leave as little sunchoke as possible on the pan.) Place the sunchokes on plates. Sprinkle with salt to taste. Serve hot or at room temperature. Roasted Sunchokes Recipe © . Photo © kthread. All rights reserved. All recipes and photos used with permission of the publisher.